Livingston Designer Outlet (Formerly McArthurGlen Designer Outlet Livingston) is Scotland’s largest designer outlet combining 90 shops, a cinema (For listings see: VUE Cinema), restaurants and bars all under one roof. At Livingston Designer Outlet you’ll discover fantastic bargains. With up to 50% off typical quality brands and designer labels all day, every day, there’s always something hot off the high street waiting to be snapped up. The centre opened in October 2002, and more than 5.5 million people visit every year. - The centre’s landmark 300ft-high glass dome was made from 100,000 sq ft glass. - One the main focal points inside the centre is a spectacular water fountain designed by celebrated Japanese artist Sumsumu Shingu. The unique sculpture, called ‘Birth of the Sky’, features cascading rain and floating clouds. - Livingston Designer Outlet also has its own time capsule, buried beneath the centre’s foodcourt. It contains the worlds smallest mobile phone, a signed Livingston FC football shirt and a Scottish Parliament Rosette. 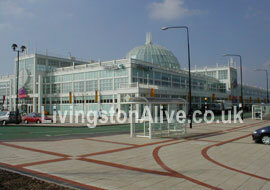 Livingston Designer Outlet is located opposite the Almondvale Shopping Centre on Almondvale Avenue! - Follow signs for "Town Centre" or "Designer Outlet"